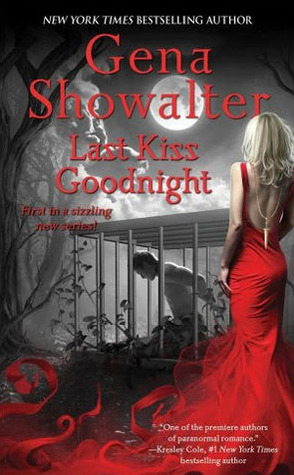 Last Kiss Goodnight is the first book in Gena Showalter's Otherworld Assassin series. Black ops agent Solomon Judah awakens caged and bound in a twisted zoo where otherworlders are the main attraction. Vika Lukas, the owner's daughter, is tasked with Solo's care and feeding. The monster inside him yearns to kill her on sight, even though she holds the key to his escape. But the human side of him realizes the beautiful deaf girl more than she seems- she's his. Vika endures the captives' taunts and loathing, hoping to keep them alive even if she can't free them. Only Solo is different- he protectors her. But as hostility turns to forbidden romance, his feelings for her will be used against him... and he'll be put to a killer test. 1. I found this book to be very cliche in its approach to paranormal romance novels. In general I like this genre, but I also like the author to bring some fresh ideas to their book, which Showalter failed to do. 2. The character of Vika is 20 years old in most of the book, but the way she was written made her feel younger, like around 16ish. Because she felt so young to me, the romance between her and Solo did not flow for me. 3. Solo's character is so over done in general. Big strong guy with dark secrets and some anger management issues. 4. The whole good angel/bad angel thing Solo has going on was a little on the weird side, and they felt really forced into the story at times.